You may not possess the skills or tools necessary to create real stained glass, but you can create faux stained glass using wax paper and crayons. Although this is a popular classroom activity, you can do this project at home in minutes. The result is a work of art worthy of being hung on the wall or as window decor. You'll need an iron, ironing board, wax paper, wax crayons, brown paper bag or other scrap paper and a pencil sharpener for this project. Cover part of your ironing board with a piece of the brown paper bag. Lay the wax paper on a flat surface, then use the pencil sharpener to sharpen the crayons, allowing the shavings to fall onto the wax paper. When you have enough shavings to cover the desired area, place the wax paper, covered with crayon shavings, on your ironing board. Cover the crayon shavings with another piece of wax paper, then place a piece of scrap paper on top. Iron the project for 10 seconds, then remove the iron to look at the crayons. If they crayons haven't melted, repeat the process over again several times until you see that they have melted. Never leave the iron on the paper for more than 10 seconds at a time. Let the project sit until cool. Use your stained glass waxed paper for a variety of projects. For example, Martha Stewart's website suggests cutting out hearts, then hanging them from the window. You can also use these to create a solar system mobile during a study of astronomy. This craft also works well for holiday projects like Christmas ornaments and Easter egg sun catchers. 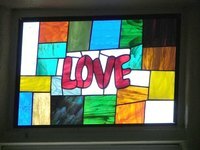 Older children and adults can take this project to the next level by creating larger, more complex pieces of "stained glass." Use a pencil to trace an image on the unwaxed side of the wax paper, then arrange the crayon shavings in each section to resemble the style of real stained glass. Frame large pieces and hang in front of a window or on a light-colored wall for display. Toddlers are too young to work with the iron for these projects, but that doesn't mean they can't create their own stained glass masterpieces. Give your toddler a piece of coloring paper and allow him to color a picture, then let him dab the picture with an oil-soaked cotton ball until the paper is translucent. Once the page is dry, your little one can proudly display his very own stained glass art. Make vibrant faux stained glass windows by repurposing dollar store photo frames, a couple of kitchen staples and old crayons.